Today on CTV Morning Live, CTVs Annette Goerner, Trisha Owens, and Sommelier Matt Steeves were celebrating Robbie Burns Day by showcasing (and enjoying) some of our favourite drinks from Robbie Burns’ native land…Scotch whisky and delicious whisky cocktails! These are all must try drinks if you’re celebrating Robbie Burns Day. Check out the CTV Morning Live TV segment here! January 25th is the day when the world takes a moment to celebrate the late iconic Scottish poet and lyricist, Robbie Burns (born 25 January 1759), who is widely regarded as the national poet of Scotland and a pioneer of the Romantic movement. He was also a fan of whisky, well writing about it anyway, but I can’t help but think the whisky helped with his creativity and romantic influence. Robbie Burns drew inspiration from the world around him to craft his most famous work. Poems and songs like “Auld Lang Syne” and “A Red, Red Rose” were created by carefully placing words and arranging sentences. When we think about Robbie Burns Day, we think of tradition, history and celebrating the legacy of an excellent craftsman. The craftsmanship of a master is also required to create delicious and aromatic whisky, like those from storied Scottish distilleries such as Glenfiddich and Balvenie to name but a few. Now although many celebrate Robbie Burns Day by participating in a Burns Supper, and chowing down on ‘haggis’, my celebration of Robbie Burns Day tends to focus more on skipping the haggis and instead enjoying a dram or two of delicious Scotch whisky! If you’ve ever seen haggis on a plate, well, let’s just say I prefer the whisky. With that in mind, I’ve got some delicious Scotch whiskies here today which would be great to complement your celebrations this evening. And since Scotch can vary so much in style depending on how long it was barrel aged and in what type of barrels (Sherry, Bourbon, Sauternes and Icewine barrels), there’s lots of choice and the whiskies I’ve included today offer a great variety whether your’re mixing premium cocktails or sipping them neat, these whiskies are great options to enjoy this Robbie Burns Day! For anyone participating in Burns Night or a Burns Supper, to commemorate the life of the bard (poet) Robert Burns, I wish you a wonderful evening! For those that aren’t familiar with a Burns Supper/Burns Night, in effect a second national day in Scotland, there’s a long-standing tradition in Scotland (and beyond), dating back over 200 years, which began a few years after the death of Robert Burns. Of course a Burns Supper would not be a Burns Supper without a good helping of some traditional Scottish cuisine, accompanied by a few drams of fine Scotch whisky. It’s customary to serve three courses during the meal, including haggis. For me, incorporating whisky, Scotland’s national drink, into your evening festivities is a must. Whisky is an essential part of any good Burns Supper, and the whiskies we’re showing here are fantastic options to enjoy this Burns Night. In honor of Robert Burns, I invite you to take the time this evening to savour some delicious Scotch whisky neat, on the rocks, or in a cocktail. If you’re looking for some recommendations, the following whiskies are very different yet each terrific whiskies that’d be fantastic to enjoy this evening while celebrating the Scottish legend, Robbie Burns. Medium amber; forward sweet malt, vanilla, marmalade and crème brulee aromas, with notes of toasted nut, marzipan, butter, cream and light oak; on the palate, light and fresh, approachably smooth and elegant; followed by malty, creamy, toasted barley flavours and notes of fruit, nutmeg, clove oil, sweet nut and spicy oak. The story behind the Rob Roy (Scotch Whisky Manhattan) goes back to the early 18th century. Vilified by the crown and the government as a cattle thief, worshiped by the people as a hero and resistance fighter, he went down in the history of Scotland and was a role model for authors such as Sir Walther Scott, even Hollywood loved his story. We are talking about Rober Roy MacGregor, also known as Rob Roy. Fast forward to the end of the 19th century and the Rob Roy cocktail emerges. While in the early days of Manhattan, and later Rob Roy, spirits and vermouth were often mixed in equal parts, over time they have given more space to the spirit base in these fine cocktails. Stir the mixture cold on ice and place in a pre-chilled coupe and garnish with a cocktail cherry and/or an orange twist. 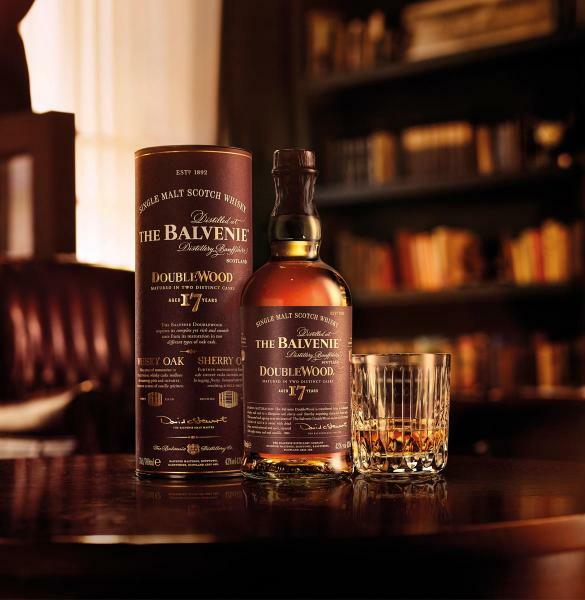 2018 marked the 25th anniversary of The Balvenie DoubleWood, aged 12 years. DoubleWood 12 was launched in 1993, using a process designed by Balvenie’s Malt Master David Stewart in 1982, now commonly known as ‘wood finishing’. To make The Balvenie DoubleWood, Balvenie’s Malt Master, David Stewart, takes whisky that has spent at least 12 years in traditional whisky casks, American Oak ex-bourbon barrels and hogsheads, and moves it to Spanish oak ex-Oloroso sherry casks for an additional nine months. The whisky is then transferred to large oak vessels called “tuns” for 3-4 months to allow the whiskies from individual casks to “marry”. The Balvenie DoubleWood single malt whisky gains its distinctive character from being matured in two different wood types. Each stage lends different qualities to the resulting single malt whisky. The traditional casks soften and add delicate character, the sherry wood brings depth and fullness of flavour and the final few months in our tuns allow the whiskies to marry harmoniously. NOSE Sweet fruit and Oloroso sherry notes, layered with honey and vanilla. TASTE Smooth and mellow with beautifully combined flavours ~ nutty sweetness, cinnamon spiciness and a delicately proportioned layer of sherry. Combine the ingredients in a glass. Mix and muddle to dissolve sugar. Add ice (block ice preferred) and stir to chill and slightly dilute. Finish with an orange twist, and squeeze some orange zest from the peel on the top of the cocktail for extra aromatic enjoyment. Fire & Cane is the fourth release in Glenfiddich’s Experimental Series. It’s a peated whisky (the fire) which has been finished in barrels used to mature rum (the cane). This adds sweet caramel and toffee notes, contrasting the sharpness of peat smoke. Nose: Billowing soft peat notes, like distant smoke on the wind. Rich sweet toffee with zesty fresh fruit notes and spiciness. Palate: Like a Highland peat campfire, with oak notes and toffee. Sharp green fruit, sweet baked apple and soft smoke. Finish: Lingering smokiness and sweetness. Fire & Cane makes a superb Whisky Sour…one of my favourites! Shake all ingredients twice, first without ice and then with ice. Double-strain over ice, then garnish with a cherry and an orange peel. Top with a dash of Angostura bitters. Ever wonder what exactly a single malt Scotch is? To be a single malt Scotch the whisky must have been distilled at a single distillery, in Scotland, using a pot still distillation process, and made from a mash of malted grain. In Scotland, the only grain allowed to be used in a single malt whisky is barley. As with any Scotch a single malt Scotch must be distilled in Scotland and matured in oak casks, also in Scotland, for at least three years and one day (most single malts are matured longer…in fact most are a minimum 10 or 12 years, and go up to 40+ years, although those are astronomically priced and very hard to come by). “Malt” indicates that the whisky is distilled from a “malted” grain. In the case of single malt Scotch, barley is the only grain used. “Single” indicates that all the spirits in the bottle come from a single distillery. Bottlings containing malt whisky from multiple distilleries are called “blended malt”. The age statement on a bottle of single malt Scotch is the number of years the whisky spent maturing in casks. Very few whiskies are bottled from a single cask, and the mixing of spirits with different amounts of ageing is allowed (such as 10, 11, 12, 13 year olds); the age statement reflects the age of the youngest whisky in the mix (10 year old in the example). Enjoy your Robbie Burns celebrations and Scotch whisky! Stay classy my friends!